This antique silver leaf, beaded-look square wall mirror features a wide frame with undertones of black, washed by gray. The textural frame of this handsome, contemporary wall mirror is designed to look covered with rows of raised, staggered beads. A distressed metallic silver leaf finish with black undertones is washed in a light gray that gives it a cohesive look. 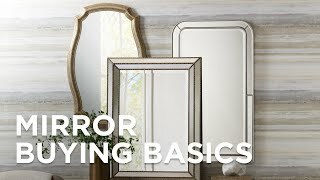 Beveled glass mirror hangs vertical only. From Uttermost. 40" wide x 40" high x 2" deep. Hang weight is 34 lbs. Glass only section is 27" wide x 27" high x 1/4" deep. Surrounding frame is 6 1/2" wide. Beveled edge is 1 1/4" wide. Contemporary framed square wall mirror from Uttermost. Distressed metallic silver leaf finish with black undertones and light gray wash. Cast polyresin frame, metal hardware, MDF backing. Does it come in 30x30? BEST ANSWER: Hi - there are no other size options available for this collection.